Morphun literacy brick add interest and focus to everyday language activities in the classroom. Wordphun exercises include rhyming, matching, word beginnings, word endings, sounds and sentences. 3DXWord on the other hand, provides a fun game with flexible rules and simple scoring to encourage children to practice word formation and spelling. In addition to the in-class learning, students can now practice online at home. 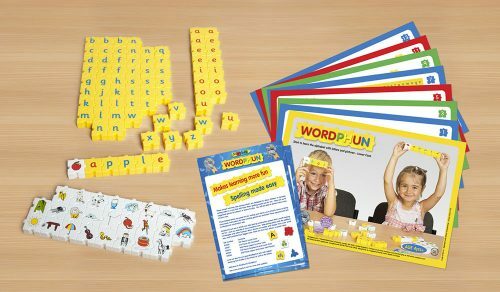 Online licences for 24 students come FREE with our Wordphun board game sets, to be used on the games site. In other words, homework without any marking! Head to morphun.education to find out more. The Wordphun range comes with both uppercase and lowercase in cursive script. Other scripts and languages are available on request. In addition all sets are also available with accompanying picture bricks, as seen here. The child makes a word related to that picture brick, providing visible results, focus, attention, and a fun way of learning. All sets come with professionally prepared curriculum based class activity sheets including exercises from earliest stages of reading to initial phonics.